Some time ago, I visited a maximum security prison in order to observe one of its mental health units. These particular residents presented unique behaviors that were quite tricky for staff to manage. Visiting prisons is not an uncommon practice for me, as I have worked for nearly a decade as an advocate for mental health services in correctional systems, primarily in my role as Criminal Justice Director for the Indiana affiliate of the National Alliance on Mental Illness (NAMI). Usually, I visited jails and prisons as the point person for the NAMI-Indiana Criminal Justice Project, to get the lay of the land and get a sense of the culture of the facility. But this time, when I arrived at the facility, I was met with several advocates from various organizations who also wanted to see the unit and they joined me for my visit. It was a memorable experience. The group entered the unit with very good intentions. They had genuine concern for the residents of that unit. However, they were intimidated by their surroundings, and lost sight that this was not a museum visit and they were not there to look at the exhibits. We were in the offender’s home. They were right there in front of us, but the group’s conversations, amongst themselves, revolved around the individuals, and were about the individuals, but were never directed to the inmates themselves. The observers marched up to cell doors to peer in without announcement or extending normal, everyday courtesy. 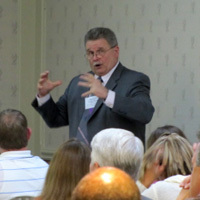 It was always clear to me that as an advocate I needed to advocate for something, not against it, and working with criminal justice agencies, especially jails and prisons, has reinforced my belief that it is critical to develop relationships and partnerships with stakeholders in order to bring about necessary changes. I have felt compelled to help educate the public that the men and women who work in our jails and prisons are in the human being business. Part of the challenge is that the public in general does not realize that if someone goes to jail or prison that they almost always go back to the community; only a very small percent of this population live out their lives in prison. But for correctional staff, the offenders are not ‘out of sight, out of mind’, and those offenders who have a serious mental illness pose real challenges to the safe, effective and humane management of jails and prisons. The data are clear from numerous sources that mental illness is far more prevalent in jails and prisons than in the overall population. In some units within a correctional facility, 90-100% of the occupants may have a severe and persistent mental illness. How can we help the staff who work with offenders with serious mental illness? I always start by trying to get a clear understanding of the units involved. Each facility has a different culture, based on its layout, environmental conditions, shift rotations, personality types and additional factors that should be considered in offering training. The more the training can be tailored to the facility, the more likely it will be accepted by the staff being trained. The issue of offenders with mental illness in jails and prisons is not going away. The burden of care will rest in the hands of law enforcement for the foreseeable future. . Therefore, education to better understand these illnesses, their symptoms and the behaviors that occur in times of crisis are a huge benefit to staff who care for these individuals. The results of the training we have provided have resulted in a decrease of use of force among those trained by as much as 70% in an Indiana Secure Housing Unit, along with a dramatic decrease in the number of assaults on staff by offenders. We are now seeing a decrease in time in restraints in an Iowa facility where our training has been provided for all line staff. These striking results are improving working conditions as well as improving the quality of life for those in their care. I have asked a few of my colleagues who have been directly involved in the training to share the significance of input from various stakeholders. I still consider myself the advocate, but you will see the psychiatrist’s perspective, the officer’s perspective, and the warden’s perspective. Each area of expertise personalizing the training to provide a true solution that works, that can grow with the organization, and that can demonstrate significant results in a positive way absolutely improving statistics within an organization. I was volunteered by one of my colleagues in the Indiana University Department of Psychiatry to help develop the training curriculum for correctional officers about nine years ago and ended up writing the lead-off segment, which introduces the officers to the major categories of mental disorders. I have been fortunate to have involved in the training ever since and have taught in prisons throughout Indiana as well as in Kentucky and Iowa. Our team has learned that most correctional line staff are very interested in mental health training and are active learners, with many questions about diagnoses, treatments and individual offenders. Our post-training surveys have shown us we are on the right track, as we have received good ratings on both content and style. I truly enjoy doing the training sessions, but for me, the most rewarding experiences have been the times when our team has been able to see the results of our training in the hard data. As an academic psychiatrist, I have long been interested in the challenge of trying to prove that what we think works actually does work. The first time we provided our training, we had a golden opportunity—we were asked to train all of the staff on a secure housing unit, or supermax unit. Because this unit tracked the number of incidents of use of force and assaults on officers both before and after the training, we were able to see if our training made a difference. We compared the number of incidents for nine months before and after the training and found that, after the first round of training, the number of incidents of use of force by the officers dropped by nearly half, from 148 to 81, and assaults on the officers by bodily waste decreased from 14 to 4. When we repeated the training more than one year later, to train new staff on the unit, the use of force dropped from 99 in the nine months before to 63 in the nine months after the training and battery by bodily waste dropped from nine to zero. When I published these results in Psychiatric Services in 2009, the article became one of very few research studies on mental health interventions in prison settings. Our most recent training was also very gratifying, as we had the opportunity to ‘train the trainers’ to provide our mental health curriculum for an Iowa DOC facility that holds many offenders with serious mental illness. These staff then started the process of training all the facility staff about mental health issues. The early results from the facility have been very positive, with dramatic decreases in the use of ambulatory restraints and hours in seclusion. I look forward to tracking this data over the coming months to see if these trends hold up. It is very encouraging to learn that something as simple as a good mental health curriculum can make a difference in how correctional officers interact with offenders who have a serious mental illness, improving the work lives of the officers and the lives of the offenders. 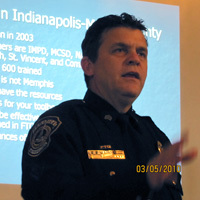 As a 26 year veteran of the IMPD, I have 15 years as a street officer, 5 yrs as a detective, and 6 yrs Field Training Supervisor. I am a hostage negotiator and have been the CIT (Crisis Intervention Team) Coordinator for the last 5 years. A very valuable lesson I learned early in my career is the value of listening. I did not know exactly what CIT was when I was told that I would be in charge of the program. 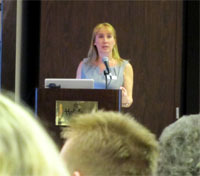 I attended the 40 hour training and was impressed with the concept and the information. I incorporated the principles that I have learned into my routine as an officer and skills that I have been taught as a Hostage Negotiator. They have been an essential element in the trainings I provide. They work. I participated with Kellie Meyer in numerous trainings throughout the Midwest and I am always impressed with the quality of people we train. It is extremely important for administrators to recognize the skills and abilities that the staff already possess and work to improve on them. I have also been the assistant Field Training Coordinator for IMPD and have learned how important it is to effectively train people. The instructor must be knowledgeable and passionate about the topic. Training Law Enforcement personnel is more challenging than the general public. It is important that the instructor recognize the abilities of the student, you must believe in what you are instructing, and you must be able to demonstrate that it is effective. A method of training that has been successful and rewarding for us is training that is designed for you and not at you. By recognizing the abilities of the student, our approach has been to demonstrate how they can really use these skills. While they may not think of themselves as particularly creative, they quickly discover how creative they can be when trying to avert a possible crisis situation. Having as many skills that come immediately and naturally to the officer is a huge plus. As we convert the training to “train the trainer” we have found the best candidates tend to be those from the front line ranks. There is a natural respect given to these individuals because the students know absolutely that the trainers practice what they preach. This is a job that doesn’t leave you when your shift is over. Their actions directly affect the next shift. It’s their job to keep others safe. These skills, when you use them, keep you safer. We’ve heard many comments as to how things have improved at home for the students. An essential component to the success of the program is the culture change within the agency that is promoted by this training. As CIT coordinator, I often found myself at odds with some of the mechanics of implementing the "Memphis Model". The Indianapolis Metropolitan Police Department allocated resources to train every new officer coming into the department using the 40 hour CIT curriculum and working with various community stakeholders to insure its success. The Memphis CIT model suggests that only veteran officers should be trained and about 20% of the workforce. The concept is to develop "specially trained officers", although I can see the benefits of having this specialty, I cannot believe that it should outweigh the possibility of training all new officers if that is available. In the projects that Ms. Meyer, Dr. Parker and I have undertaken in the corrections environment, the revolutionizing statistics came when everyone on a unit was trained. It is my belief that training new officers can have a tremendous benefit similar to the one experienced by Ms. Meyer, Dr. Parker, and myself. Both models need in-service days to keep the officers current in their knowledge base and practice of de-escalation skills. This is on-going training that can meet the needs of every officer. Training is simply education. Police departments that have unlimited resources, which are far and few between, can implement certification. I personally believe that the training self selects individuals that are very caring people. What I mean by self selects is that people that properly use the training and go above and beyond are the individuals that step up and are leaders. In a jail or prison setting it seems a little easier to see if officers are putting into practice what they've just learned. They have an opportunity to work as a team and need to work as a team consistently to have the best results and maximize safety. It simply does not make sense to train one or two people on a unit when everyone involved needs these skills. Culture change seems to be occurring naturally with the training, but the segments we teach have improved dealing with diverse populations on many levels. Understanding people and their emotions especially at their most vulnerable moments is very difficult. Making sincere connections are paramount to finding positive solutions. Additionally, the officers need to understand how to take care of themselves. They are so busy helping others they forget to look after their needs. We stress the importance of this training on the job and at home. Much of the success of this training lies with the teamwork we've created. Bringing stakeholders together to train, as well as to learn, has definitely made a difference. While we share a common goal for the client, the mental health professional, the advocate, and the officer coming together this way has definitely made a difference in their continuum of care and quality of life. Current data from two Indiana DOC training efforts supports our belief that the proper use of crisis intervention skills in a correctional environment will dramatically decrease the use of force. 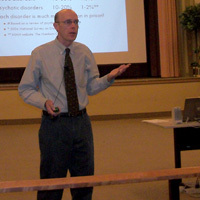 The mental health training of SHU officers at the Wabash Valley Correctional Facility in 2004 and 2005 resulted in a 70% initial reduction in the use of force in a high security unit. Data collected at the New Castle Correctional Facility, where I presently work, from 2009, 2010 and 2011 illustrate that mental health training and improved administrative procedures result in a sustained reduction in the use of force on a prison unit that functions as an inpatient psychiatric unit for offenders with serious mental illness. 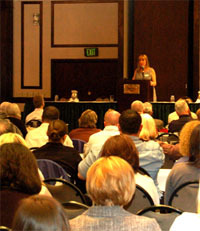 Discussion about mental health issues with correctional staff on the unit began at roll call in November 2009 and culminated in training in February and March 2011, using a training model based on the Crisis Intervention Team model, as adapted for a correctional environment by the National Institute of Corrections. The following table illustrates the number of incidents of use of force on the Mental Health Unit at the New Castle Correctional Facility. New Castle Correctional Facility reinforced and complemented the training with three specific procedures. The Incident Mapping Model developed in law enforcement and adapted to corrections is an excellent vehicle for monitoring and documenting incidents in a correctional facility, which allows management and staff to adjust resources and focus on problem areas. The data collected can also highlight potential supervisory, personnel or policy issues and problems needing attention. The data to support sound management decisions and provide a scorecard for incidents by unit and shift comes from the Incident Mapping Model and the database it creates. Attached is a training module for Incident Mapping. The second administrative procedure that supports the training and mapping is the review of all incidents of use of force. This review must be at a high level at the facility. In our facility, the deputy/assistant superintendent/warden, chief of security, medical administration, and investigator level are key to provide the necessary focus and follow up this review requires. The follow up and feedback in the form of training to those involved in the use of force is based on better alternatives and skill review. Also, those who “do it right” are acknowledged. Attached is a training module for this use of force review. The third important procedure and process is the treatment/unit team. The team is the focal point for the development of strategy and documentation to improve and manage the offender’s behavior. As in the use of force review the make-up the treatment team is key to success. Tactics and rewards for behavior are developed, as the team controls the critical decisions that affect each offender. Also, it is important the team understand the elements of a functional team and predetermine how risk, conflict, decision making and accountability is to be handled. Attached is a training module for the treatment/unit team. Clearly, mental health training, accompanied by training in communication/listening skills, and demonstration through role plays are essential to the reduction of the use of force in a correctional environment. This is supported by the facts presented. In addition, it is also critical to complement the training with procedures and processes that provide incident mapping, use of force reviews and functional treatment/unit teams. This multiple-discipline approach sustains the decrease in the use of force. When people have access to treatment in the community their chances of living successfully and independently are greatly improved but these resources continue to be cut and prisons and jails are increasing the number with mental illness.